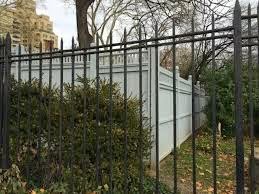 Mayor de Blasio failed to secure the proper permits to build his “privacy fence” around Gracie Mansion — and the Parks Department is now scrambling to file the paperwork after the fact, City Hall officials admitted Friday. On Thursday, The Post exclusively reported that the mayor ordered the construction of a roughly 10-foot-tall fence inside an existing 6-foot brick wall to keep the public’s prying eyes out of his yard. Officials couldn’t say whether any employees of the Parks Department, which handled the construction for the mayor, would be disciplined for building the barrier without first obtaining the alteration permits they needed.